Wasn’t it just yesterday that I was taking Taylor to daycare for the first time. Leaving her sweet little 10 month-old self in the care of someone who wasn’t me or someone else related to her? No? Well, then it had to be just yesterday when I left my sweet 7 month-old baby boy in the infant room for the first time? What? No, again? 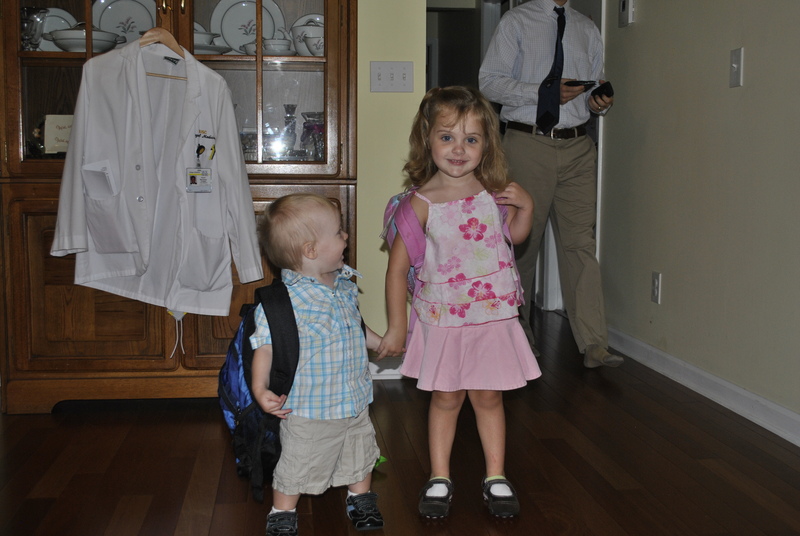 I didn’t think I would be one of those mothers who cried when their kid(s) went off for the first day of school…but alas, I am…and this was just the first day of 4 Year-0ld Preschool and the Toddler Room. I think it was mostly because Taylor was so nervous about this new class. She had gotten very comfortable in the 3s class and loved her teacher – she had grown a lot in that room – she had made friends – she had learned many things – she knew the rules – she knew the toys – she knew the routine. And now all she knew was that everything would be new. I could see it in her eyes. And I could fell it in my heart (and my eyes). Even though I cried with her a little, I knew she would be great. She’s really smart. She’s sweet as pie and quite funny. She picked out one of her favorite pink outfits and suited up with her awesome princess backpack. She put on her new shoes without holes in the toes and her beautiful smile. She was ready. I knew she was ready. Caleb was oblivious – except for the fact that I tortured him by putting a very large backpack* on his very little back. 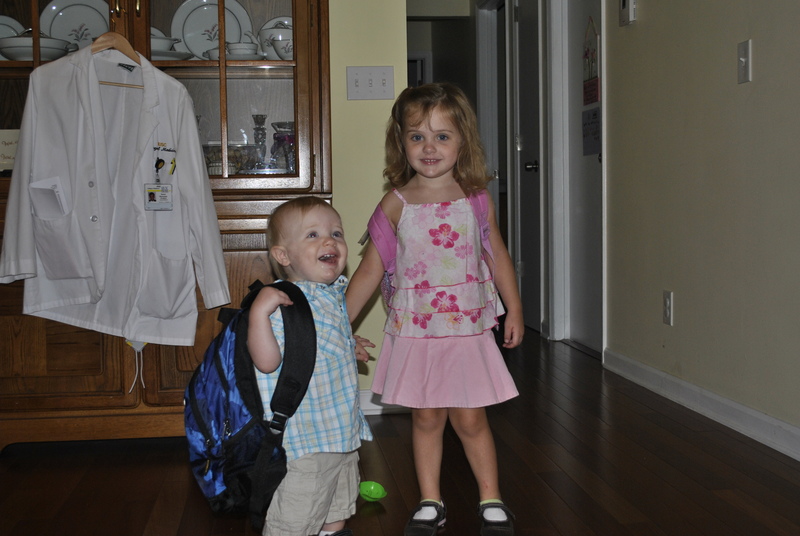 He doesn’t really care where he goes, as long as his big sister goes with him. I love those kids, even if I hate how quickly they are growing up. 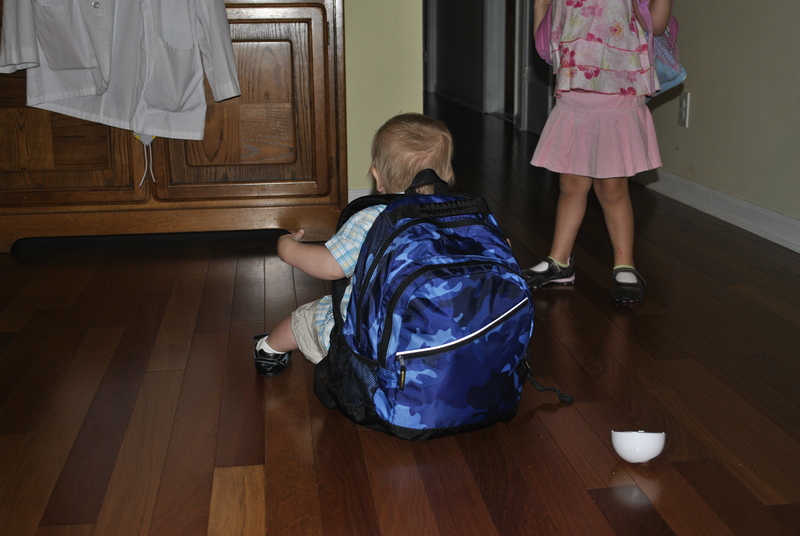 I am in no hurry for Caleb to grow into his backpack. *The backpacks have their nap stuff in them – no books yet, thank goodness…maybe they’ll stay little just a little while longer. Caleb’s backpack is cracking me up! I couldn’t handle the idea of Ryleigh grow up so I am in denial. If I don’t send her to school, she isn’t growing up, right?! How are they so big?! Love the backpacks! And you!